The South is changing; traditional southern culture is colliding with a contemporary world creating a sort of southern renaissance right here in Greenville, SC. 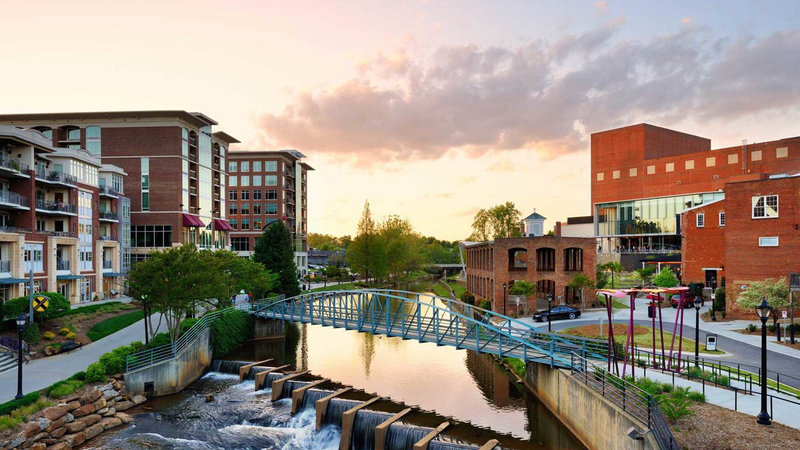 “Yeah, that Greenville,” is experiencing unprecedented growth as people from all over the nation and the world come to call it home. Sure, some things are still the same. Southern fried, cultural Christianity is still around, but more and more, Greenville is becoming a hodgepodge of different cultures, ethnicities and religious backgrounds creating massive gospel opportunities. The Church at Cherrydale exists to multiply disciples to the glory of God. In 2009, The Church at Cherrydale began as Renewal Church, a new church plant in Greenville, SC. In 2013, Renewal Church merged with Covenant Grace Baptist Church to form The Church at Cherrydale. In the years that followed, The Church at Cherrydale has planted two churches in the greater Greenville area and has sent a number of missionaries to foreign fields. Our heart continues to be a church that equips and sends the next generation of missionary disciples to plant churches that will bring the gospel to the ends of the earth. Since September of 2014, The Church at Greer Station has been laboring in the city of Greer, a town in the heart of GSP. TCGS exists to multiply disciples to the glory of God and for the good of Greer. Greer is a small revitalized community in need of vibrant, healthy church presence. TCGS is a kingdom community on mission with God – followers of King Jesus living in community with one another working to live and preach the good news of Jesus. Our heart is to be at the core of this small town’s exciting new life. The Church at Blue Ridge is the second church to be planted by The Church at Cherrydale. Blue Ridge, while not listed on any map, is certainly very real in the minds and hearts of the people who live there. The community is located in northern Greenville County, SC and has experienced tremendous growth and development in the past ten years. Blue Ridge needs an increased gospel presence, and our passion is to see God raise up a community of people transformed by the Gospel who are making disciples in Blue Ridge and around the world for His glory. Generation LINK Residents get their hands into almost everything. We pour into and invest in our Residents, so they may be equipped to serve in all areas, from contact work to outreach event planning to church planting leadership. We find that Generation LINK Residents bring an energy and momentum to combat the sometimes-rhythmic lethargy of summer. Generation LINK Residents spend about half their time in the church office/classroom (15-20 or so hours) and the other half of their time out in the community, occasionally in strategic part time jobs. Generation LINK is vital to many supplementary ministry areas, including Men and Women’s ministry, Youth ministry, Children’s ministry and graphic design. If you participate in Summer LINK Greenville, you will serve as an intern at TCC, or one of our two church plants, TCGS or TCBR, in ministry areas that include: Children’s ministry, College ministry, Student ministry, and Worship ministry. While serving, one of our elders or staff team members will mentor and help you grow as a young leader. But what if I need to work or go to school during the summer? No problem. We have designed Summer LINK Greenville so that you will serve 15-20 hours a week. This will leave plenty of time to work a part time job or take a summer class. But where will I stay? We have thought of that too. When not serving or spending time with the other residents, you can stay with a host family from one our three churches. Simply put, if you want to meaningfully serve a local church in the upstate and want to be invested in as a young leader, there is no reason why you should not give your summer to Summer LINK Greenville.